Since getting back home from EVE Vegas late Monday night I've spent a little time on Singularity looking at the upcoming version of The Agency. My main concern after attending the sessions in Las Vegas is that CCP would make The Agency a useful tool for hunters to track down prey. At this point, I don't think that is a major concern. Signatures and sites only appear in the system a player is in, which means hunters still need to roam. The only purpose of the functionality in my mind is that players can now effectively "see" more of the local system without having to undock. I still have concerns that the new mining ledger functionality is too powerful, especially if connected to external websites. I hear that CSM member Steve Ronuken is working on a site that potentially will prove extremely helpful to hunters, depending on the amount of miner buyin to the idea. That's right, if all goes according to plan, miners will provide the rope that hangs them. 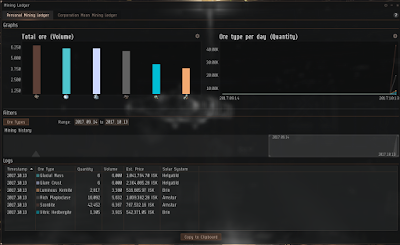 A very EVE-like idea that I plan to watch closely as time goes on. After all, I don't want to lose a ship just because someone else is dumb. I lose enough because I'm dumb. I'll probably spend some more time on Singularity testing out Lifeblood content this weekend after I finish up my mining to make Gaze probes. I do want to test out my Warzone Extraction fits to see if they will work to run the Crimson Harvest sites in high sec. Since I have a little time, I might even take them into low sec, since I received some requests for that during the Warzone Extraction event. So I have a list of things to do in EVE this weekend. Maybe the writing will pick up again next week as I find more new things. One of the long-running themes around EVE Online is, "EVE is Dying!!!" While the game has declined since its peak in 2013, the game is pretty active for a 14-year-old title. Of all the EVE killers to emerge, though, the biggest recent threat is Star Citizen. If the game had come out in the 2014-2016 timeframe as originally advertised, CCP as a company probably would have felt a lot of financial pain. But beginning in 2015, CCP implemented financial moves to become a major player in the virtual reality market. In April 2015, CCP bought back $20 million in bonds two years early. That news was followed in November 2015 with the announcement that venture capitalists had invested $30 million USD into CCP for the purposes of developing virtual reality games. A week later, CCP's first VR game, EVE: Gunjack, released on the Gear VR, with releases on the Oculus Rift, HTC Vive, and Playstation VR occurring throughout 2016. EVE: Valkyrie also debuted on the three VR platforms in 2016, with a non-VR version releasing just last month. And at the end of August, Sparc released on the Playstation VR. With the recent emphasis on the development of VR content, Hilmar's presentation on the first day of EVE Vegas, titled "CCP Presents", provided the surprise of focusing on non-VR games. The two games discussed were Project Nova, the followup to DUST 514, and Project Aurora, which promises to bring the EVE Online universe to mobile devices. Interestingly, CCP is not trying to develop the games alone. To develop the new first-person shooter, CCP is working with UK developer Sumo Digital. Doing some research after the presentation made me a lot less impressed with the developer than Hilmar made them sound from the stage, but I guess that's expected at this point. The developer working on Project Aurora is the Finnish studio Play Raven, who seems a good choice to work with as a mobile game studio. Play Raven co-founder and CEO Lasse Seppänen appeared on-stage, where he was roundly booed when he described Project Aurora as EVE Online with less spreadsheets. Yes, EVE players love their spreadsheets! Now, despite Chris Roberts and Cloud Imperium Games doing their best Blizzard impersonation and announcing the release of Alpha 3.0 to the Evocati test group Friday morning, I think CCP is in good shape. By the time Star Citizen launches, probably in late 2019 or early 2020, CCP's product line should have diversified enough to withstand a hit caused by the release of a new game. Depending what I hear over the next two days, the promise exists that CCP's product line will prove superior to what CIG eventually produces. Two years ago, I thought Star Citizen could cause CCP problems. Now? Unless CIG has something they haven't shown the world, CCP is in good shape. Walking around Las Vegas, I think I found the most meta concept I'll run across before registration for EVE Vegas even begins. To me, Las Vegas is a rather escapist place. A city designed to part visitors with as much money as possible, Sin City offers the promise of a refuge from the reality of a mundane life, at least for a weekend. I find the illusion rather threadbear myself, which is why I find the presence of people selling virtual reality experiences so amusing. Even in Vegas, some people believe that the way to wealth is to provide an experience in a place away from the reality surrounding them. I understand the lure of virtual reality equipment. I own an Oculus Rift and a Gear VR and last week finally purchased the Touch controllers. I still haven't played EVE: Valkyrie as I got sidetracked into playing a sci-fi themed tower defense game called Defense Grid 2. With your vision totally focused on the experience in front of you and headphones blocking out all outside sound, virtual reality offers an escape from everyday life without having to leave your home. I think the trend of storefronts offering virtual reality experiences to people is a promising sign for the VR industry. Back in the 1980s and 1990s, the video arcade allowed those who could not afford to purchase game consoles a chance to play video games. Is it any wonder that as equipment became more affordable, video game revenue ($91 billion worldwide) surpassed movie industry ($38.6 billion) and music industry ($16.1 billion) revenue combined? According to the Venture Beat article, the first year of virtual reality was "sobering", with the industry only growing to $2.7 billion. As someone who spends a lot of time thinking about video games and the surrounding issues, I could easily get caught up in an echo chamber that says that, while I might enjoy VR myself, the technology just isn't their. Sometimes, walking away from the keyboard and experiencing different places where I wouldn't normally travel, is necessary to bring a different point of view. To me, the early indications are that VR is at a point the video game industry was at 30-35 years ago. I may not live to see the day where VR becomes as ubiquitous as computers are today. But I'm pretty sure the day will arrive. I'm sitting somewhat comfortably in my room in The Linq on a beautiful Thursday morning typing out a blog post with a way-overpriced pumpkin latte and a bag of chips. Sorry, but when the untaxed price of a grande pumpkin spice latte is 23% higher than the price of the same product in Chicago's special taxing district covering the Loop after taxes, then you know the prices are jacked up. Then again, the fact that I couldn't use my Starbucks reward points to purchase said overpriced latte probably doesn't help my mood. My first 24 hours on vacation was kind of like EVE. Sometimes great and sometimes frustrating. Despite a call from work, I was packed, garbage taken out, dishes washed, bed made, etc, a full 20 minutes before the pickup time. The limo service I use once again came through like a champ, arriving 10 minutes early, meaning after I finished fiddling around, I left exactly on time. The drive was smooth and fast, the American employees doing the curbside check-in had me processed in two minutes, and I breezed through the TSA check point. Time from leaving my house to clearing airport security: 45 minutes. Yes! The American terminal at O'Hare International Airport is really nice and has a lot of eating choices. I wound up picking up a fish sandwich at McDonald's for lunch and a pumpkin spice latte at the Starbucks across the aisle from my gate a couple of hours later. The only bad thing that happened was I started to get a case of the sniffles right before boarding the flight. Well, something happened to American's computer system, but as I had a physical boarding pass, I wasn't affected. The flight itself was pretty good. I spent a little extra money to get a seat with extra leg room, which I need due to getting a little older. As an additional perk, the middle seat in my row was empty, which was really nice. The flight did have to sit at the gate an extra ten minutes, which meant getting into Las Vegas 10 minutes late, but that's not a big deal. I spent the four-hour flight outlining a future blog post on my view of the Gallente Federation and listening to EVE Online parody songs. Oh, and the sniffles got worse. Things started going really pear-shaped travelling from the airport to The Linq. Looking at Google Maps, the distance is 2.6 miles. The trip by shuttle bus took 70-75 minutes. By way of comparison, travelling from Keflavik International airport to a hotel in downtown Reykjavik when I travel to Iceland for Fanfest typically takes under an hour, with the Flybus typically covering the 50 kilometers from the airport to the bus terminal in 45 minutes. The hotel itself I'm still up in the air about. I don't like the layout. I actually got lost for a bit as I went to the wrong elevator bank. I discovered I'm on the same floor as the spa and fitness center, which means I'll probably run into some of the folks from Fitfleet. I ran into J McClain walking out of the fitness center this morning while running down to Starbucks this morning. I'm not the only one getting confused, either. I ran into Random McNally of the High Drag podcast and he said he found the layout a bit confusing also. But he also seems to like the place after getting acclimatized. Plans never survive contact with reality on the ground, and my meal plans are no different. Random recommended the Hash House. The restaurant is a little pricey, but the food is good and the portions are huge. Sounds like the place to go before going to the Open Comms show. So I'll go to the Hash House for a late lunch and hit up Holstein's in the Cosmopolitan after the OC. Hopefully I'll run into Crossing Zebras' writer Dire Necessity if he doesn't read this and let him know. I did have one more problem in my room. Connecting to the hotel wi-fi. When I tried to connect, all I got was a connection to wi-fi, but no internet connectivity. That wouldn't do. So I went to call someone from my phone. No dial tone with the phone. Ugh! So I went down to the desk and found out I shouldn't need any instructions. I left frustrated and wasn't as nice as I should have been. After taking 15 steps, I ran into J McClain and his lovely wife and he asked me how things were going. He probably heard more than he wanted. Sorry J! Then, as usually happens when J stands in one place for any length of time, a crowd started to form, so I made my goodbyes and went back to my room. The problem with the wi-fi? Apparently The Linq's site triggered something that required me to reconfirm my security settings in Windows 10. Once I performed that task, I had wi-fi and internet connectivity. I wonder if that's because I leave Cortana turned off as much as possible and the Microsoft programming makes life more difficult until you start using her. Hey, I think that's a perfectly reasonable piece of tinfoil! As I finish up typing this post, local time is now after 11am, which means it's time to start exploring the city. Or at least the famous Vegas strip. I have my new camera I bought for Fanfest this year and I should go out and play tourist. Oh, and try to find out if Dirk MacGirk is still alive and find out where the Open Comms show is broadcasting from tonight. UPDATE: The location of the Open Comms broadcast tonight. By this evening I should find myself unpacking a few things in a hotel room in Las Vegas. For the third year I'm travelling to Sin City in order to attend EVE Vegas. The city isn't a place I would normally travel to, but with the largest collection of EVE players in North America each year why not? Today is a travel day. Normally, I wouldn't worry, but with President Trump visiting Las Vegas in the aftermath of Sunday's horrible shooting from Mandalay Bay, who knows what might happen. With my luck, I'll get stuck on the tarmac for an hour or two waiting for Air Force One to take off before anyone can depart. Perhaps I should just hope he stays overnight. On Thursday I only have two planned events. The first is to walk over to the Cosmopolitan for lunch. One of the restaurants makes delicious alcohol-laced milkshakes. I'll need a big meal to prepare for the second event. At 6pm, Dirk MacGirk, Dreydan Trovirr, and a whole bunch of others will broadcast the Open Comms show on their old day. I'll have to find out where the broadcast will take place. On Friday morning, I plan to attend the Talking In Stations breakfast. For those unfamiliar with TiS, it is a podcast that records live on the Imperium News Twitch stream on Saturday mornings. In the interest of full disclosure, I have appeared on the stream/podcast a few times. I'll need to locate the restaurant on Thursday because I have the feeling I might wake up late and need to rush in order to get seated with the group. After breakfast, I think we are all going to go to the registration area and get our badges. Apparently we get some discounts at local bars and restaurants, so we will indeed need our wristbands and badges. The first three events I think almost everyone will want to attend. The first session at 2pm is a welcome session hosted by CCP Guard and CCP Falcon. Next comes the EVE Online Keynote at 3pm which will give attendees a look at what's coming up in the Lifeblood expansion in 3 weeks. Of interest is who will give the keynote as Executive Producer CCP Seagull is on maternity leave. Closing out the day's presentations is a session called "CCP Presents". If the session is like the similarly named sessions at Fanfest, we'll get to hear all about CCP's upcoming virtual reality products. If we're really lucky, we might find out the future of CCP's planned follow-up to DUST 514. I remember seeing job postings for the Reykjavik studio that suggest CCP is working on a new game. Whether that game is a new FPS game or something else gives me something to look forward to hearing. Saturday's lineup of events looks better than what I've seen at Fanfest the past couple of years. At 10am CCP Affinity and CCP Vertex will give a 30 minute presentation on Resource Wars, a feature coming in Lifeblood that I look forward to giving a try. At 10:30, Mike Azariah takes the stage to talk about why the end game of EVE is so elusive. At 11am, CCP Burger will give an hour-long presentation titled "Shipyards & Future PVE". I get the shipyards part as CCP is still rolling out structures. But future PvE? My curiosity is peaked. We don't break for lunch until 1pm, which means Matterall will give his talk on Continuum of War to a crowd that may want to eat something. The Talking in Stations host will cover warfare from the Battle of Asakai to today. When I originally looked at the schedule, I considered not coming back for the afternoon sessions. But the 2pm session on Upwell Structures is one that could prove extremely interesting. The speakers are CCP Fozzie and CCP Nagual. We may get some more concrete timing on what CCP Burger discusses in the morning. If anything, the description of the talk mentions the structures roadmap. I think for that alone I need to attend. I don't plan to go to the 3pm sessions, but I might go and listen to CCP Rise discuss balance issues at 4pm. The title apparently is a bit misleading. On Sunday, I think I'll sleep in a little and make CCP Punkturis and CCP Sharq's presentation at 11pm the first one I attend. I do want to find out the future of The Agency, and the presence of CCP Punkturis suggests we will get a lot of information about an improved user interface. Also, pink cartoon cats. At noon, Max Singularity (aka The Space Pope) will give another lecture on the physics of spaceflight in the EVE universe.. Max contributed to the Frigates of EVE book and will explain more about how ships are powered. Max's lectures are must attend events at EVE gatherings. I might take a long lunch on Sunday. But if I don't, I'll show up at the EVE Lore Q&A. I do like the lore so hearing the lore hounds pepper CCP Falcon and CCP Affinity with questions could prove enlightening. The next two sessions are player presentations running 30 minutes each. The first is by Emmaline Fera titles "Leadership Lessons From EVE Online". Considering Emmaline works in the tech business, listening to her insight might make me laugh. She can get just a little sarcastic. The final session before the closing ceremony is Elise Randolph and Debes Sparre discussing how to build doctrines. I figure by the time 3:30pm rolls around on Sunday, I won't feel like getting up to go anyplace else. For those interested in the event but unable to fly out to Las Vegas, CCP will stream all three days on Twitch. As usual, those at the event will probably know less of what's happening than those at home. Considering Las Vegas is one of the few places on earth more expensive than Reykjavik, the ability to order out while watching saves on money also. As for me, I plan on treating Las Vegas like Chicago this year and take a little extra care walking around. Not only do I plan to stay safe, I might wind up saving a little money at the same time.